Music and crime fiction go together. From “Stagger Lee” and “Frankie and Johnny” to “The Long Black Veil” (more on that in a bit), “Miller’s Cave,” “Timothy” and a dozen other titles you or I could name, murder, theft and death are common topics of each medium. 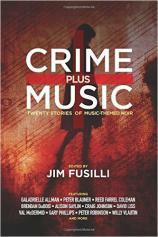 CRIME PLUS MUSIC, which is edited by Jim Fusilli (who has feet firmly planted in both fields as an author’s author of detective fiction and a respected music critic for The Wall Street Journal), has compiled a very worthy volume consisting of 20 stories in which crime and music merge and intersect like the infamous crossroads where, so the story goes, bluesman Robert Johnson sold his soul to the devil in exchange for the ability to play guitar. Warning: Please set aside enough time to finish reading CRIME PLUS MUSIC before you start it. You will want to read it all the way through in one sitting. There isn’t a misstep in the bunch --- from the opener, “The Last Temptation of Frankie Lymon” by Peter Blauner, to “Boy Wonder,” Fusilli’s anthology closer. The placement could not have been by accident. Blauner is a popular music aficionado, and his story of the quick rise and hard fall of a popular doo-wop singer in the early days of rock ‘n’ roll hews whisker-close to the truth. Fusilli contributes a tale using a cutting edge music genre as a backdrop. In “Boy Wonder,” a high school student becomes an overnight sensation --- literally --- in the EDM (electronic dance music) genre. It is a cautionary tale, as many of the stories here are, with this one about giving up what you want most for what you want now. You don’t even have to be familiar with EDM to appreciate the story, or have it haunt you long after you’ve finished it. The stories bookended by the two described above maintain the quality with which CRIME PLUS MUSIC begins and ends. Many of them, as with Blauner’s tale, are extremely close to the real world. In “The Blackbird” by Peter Robinson, a Nick Drake-type singer-songwriter meets his true love and ironically pays a price for something he never bought. Those familiar with the story of The Runaways will see a somewhat parallel line within “The Misfits” by Naomi Rand, as she spins a tale of what might have been rather than what actually occurred. Meanwhile, Reed Farrel Coleman’s “Look at Me/Don’t Look at Me” features a one- time radio star on the downside of his career who is about to makes a fateful choice. Those who were glued to the radio in the early 1960s will almost immediately recognize the subject of this story, though in the real world things worked out somewhat better. As far as the unreality goes, Gary Phillips offers up a slice of the supernatural in “Shaderoc the Soul Shaker,” wherein a once-great musician who hits a brick wall while composing a film soundtrack gets some hallucinatory help from an otherworldly source. 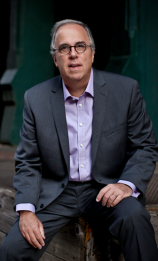 "Please set aside enough time to finish reading CRIME PLUS MUSIC before you start it. You will want to read it all the way through in one sitting. There isn’t a misstep in the bunch... Buy this book and read it, with your head stuck between some speakers and your favorite song collection amped to 11." Many of the stories in CRIME PLUS MUSIC find the music being used with bad or questionable intent. “Earworms,” from Zoë Sharp, presents music being used as an instrument of torture or enhanced interrogation (depending on where you fall on the issue) before answering to the law of unintended consequences. A track by Beat Happening --- “Me Untamed,” which is also the title of David Liss’ fine contribution to this book --- provides an impetus to perform an act that would not be done otherwise, and, as we ultimately learn, more is the pity. Then there is “Watching the Detectives” by A.J. Hartley. This story is a bit different for Hartley but is an excellent tale nonetheless, concerning a serial killer inspired by the Elvis Costello song of the title. And then there is “Played to Death” by Bill Fitzhugh, wherein love of music collides with its commercialization, to bad but brilliant effect. Other stories defy instant classification, other than “terrific.” A couple are cousins, if you will, being stories that deal with similar topics in very different ways. “1968 Pelham Blue SG Jr.” by Mark Haskell Smith deals with a problem similar to “A Bus Ticket to Phoenix” by Willy Vlautin (more on that title in a moment), as a band’s instruments go missing after a gig and what is involved in getting them back. The stories also deal with life on the road; perhaps the protagonist of “No Place You’re Likely to Find” by Erica Wright should have read one or both of them before attempting a midlife career change as a traveling musician looking for a break but encountering something far different. My favorite story in CRIME PLUS MUSIC? I have a number of them, actually. First among equals would be the aforementioned “A Bus Ticket to Phoenix,” simply because of the manner in which Willy Vlautin --- the best writer you’ve probably never heard of --- nails the road-weary gestalt of a low-level touring backup band. “All Ages” by Alison Gaylin is a close second favorite --- and yes, depending on my mood, it nudges itself into first place --- about going to the funeral of a long-ago friend and the shared memory of a concert, and the dark events that occurred. NB: Listen to the album Los Angeles by X while you read this one. Oh, and then there is the absolutely wonderful “The Long Black Veil” by Val McDermid. The song by the same name is a crime novel told in a little over three minutes, with murder, mistaken identity, adultery and sacrifice comfortably in the mix. Listen to all three versions by Lefty Frizzell, Johnny Cash and The Band before you read McDermid’s story, which provides a couple of unexpected twists. While I love the song “The Long Black Veil,” I HATE “Dr. Wu” by Steely Dan. In fact, I almost skipped “Are You With Me, Doctor Wu?” by David Corbett. Missing this cryptic tale about a musician who gets a bad batch of heroin and a second, but not necessarily better, chance at life would have been a huge mistake. Similarly, I hate bagpipe music. Brendan DuBois’ wonderful tale, “The Long Lament,” hinges on bagpipes, but primarily concerns a long-absent son who returns home for his angry father’s death vigil. This story, perhaps more than any other in this collection, should become a novel. There are stories of equal quality that aren’t immediately classifiable. Craig Johnson offers “Unbalanced,” a Walt Longmire story --- previously available in WAIT FOR SIGNS --- wherein the iconic lawman encounters a stranger on a cold night at a gas station, a meeting that leaves them both the better for it. “Vincent Black Lightning” by Tyler Dilts features Long Beach homicide detective Danny Beckett. You may not be entirely familiar with Dilts’ work, but I guarantee that this short tale of a bad life and a worse death will have you looking for his novels, as well as seeking out the Richard Thompson song after which this story is titled. And just when you think that Fusilli might run out of stories, he cajoles one from none other than Galadrielle Allman, whose musical heritage needs no introduction. Allman favors us with “Only Women Bleed,” a dark cautionary tale within an even darker coming-of-age vignette, one in which a musical game signals a beginning and an ending. I would be first in line to read a novel based on this story as well. Forgive me. I have gone on for far too long about CRIME PLUS MUSIC and could go on much longer. I actually could have summed it up fairly shortly and easily: Buy this book and read it, with your head stuck between some speakers and your favorite song collection amped to 11. Go for it.